Will a money-back guarantee send you broke? A couple of months ago I needed a new toaster. I visited Sears and collected my toaster of choice. Of course I wanted the latest technology so I ended up with a unit that had 4 wide slots with high-toast lift, infrared sensors to get that perfect brown every time, an array of settings including defrost, reheat and bagel, a comprehensive LCD panel so the kids could work out how to use it and an attached egg-cooker with meat warming trays. You couldn’t buy a more advanced toaster. Unfortunately the technological envelope was pushed a little too hard and the toaster stopped working after a month. I walked back into the store with the toaster under my arm and sat it on the counter and explained that it stopped working after a month. The salesperson was very helpful and walked over to the huge array of toasters and asked if I would like to buy a different model this time. Buy? I obviously didn’t explain myself well enough. I repeated that I bought it from this store only a month ago. The salesperson fully understood the situation. He explained that the product has a twelve month guarantee and they tried their best in the manufacturing of the product but it didn’t work out this time so – whoops and sorry - but I had to buy a new product. Obviously I wasn’t impressed and this wasn’t my understanding of how a guarantee would work. I would guess the vast majority of the population would expect the company that produced the product to “make good” the product that I bought in good faith. This story is so ridiculous it is obviously fictitious but why is it so different for an MSP? An MSP makes promises on delivery of services and timeliness associated with that delivery. In the same way that a manufacturer uses their best endeavors to produce a product that won’t fail, sometimes it fails. They then have a responsibility to repair or replace the product at their own expense. No reasonable MSP deliberately misses a response time or intentionally misses a maintenance check – but sometimes it happens. I don’t believe it is good enough for an MSP to simply say sorry. I think the customer service expectations are at a level now that a client will expect a bit more than “we tried our best.” You can have the best excuse in the world involving your wife’s brother’s uncle’s son’s dog that needed nails clipped but ultimately, your clients don’t care. They want results, not excuses. A money-back guarantee shows the client that you are serious about delivering on your promises. They know you aren’t going to make wild promises that you can never fulfill if you are going to experience pain if you don’t deliver. It shows that you are going to be accountable to your clients. Our strategy was to offer a refund of five percent of a client’s monthly fee if we failed to deliver on any one of five key measurable deliverables. These were: Phone response times; On-site response times; Maintenance schedule booking dates; Consultancy discussion booking dates and security updates. Did we ever have to pay a client their five percent? Absolutely! Our organization was not perfect and neither were our staff. When we would call a client to inform them that we had not delivered as per our contract and wanted their bank details to refund them five percent, the client argued against it every single time. Most of the time they didn’t even know we had missed a key measurable. Not only did it seem the right thing to do, it actually made great business sense. All our staff knew that there was a money-back guarantee clause. Giving money back is not a great way to run a profitable business so the staff (although scared at first) fully embraced the accountability the guarantee delivered. I believe we offered better service than our competitors and this was one of the items that kept our staff focused. The guarantee also made it easier for our salespeople. 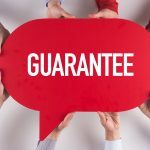 “We have so much confidence in our service that we offer money-back guarantees” made a great sales pitch. The last major benefit was word-of-mouth. When we did give a client an amount of money back, they would sing from the hilltops to all that cared to listen about how dedicated we were to delivering on our service promise. It was invaluable. New clients would walk in the door asking to have that arrangement “where you get money back if you guys mess up”. Many MSPs who don’t offer this are scared it will send them broke. They think that clients will deliberately set them up or take advantage of them. There is a well-researched statistic that says 1.7 percent of the people in the world are jerks that want to make your life difficult. We have all experienced them and they can be time-consuming, annoying and cost our businesses money. But… the last thing we should do is build our businesses to cater to the 1.7 percent rather than the 98.3 percent who want to do business with us in a reasonable sensible manner. This 98.3 percent don’t have the time to deliberately try and waste their time to secure a five percent refund. They just want to get on with business. If you are scared that you will be consistently missing key measurable components then I would have a good look at your systems and processes before implementing the money-back guarantee. Don’t hold off forever though – this is one of my five key items in a modern SLA and your competitors may already be offering it. Home » Managed Services Providers » Will a money-back guarantee send you broke?